The United States Patent and Trademark Office (USPTO) has granted a patent to Dr. Suresh Mishra’s team in the Section of Endocrinology & Metabolism on novel “preclinical models for obesity and obesity-linked cancer (Mito-Ob)”. These preclinical models are developed using an innovative approach by simultaneously manipulating adipose and immune functions in the body. Consequently, they spontaneously develop obesity and obesity-linked cancer in a well-defined timely manner, and have created new research opportunities. Their various uses include: 1) Discovery and development of new therapeutic targets for obesity and obesity-linked cancer, 2) Various types of intervention studies and 3) Preclinical drug screening. Dr. Daniel Sitar, Professor Emeritus Section of Clinical Pharmacology, has been granted an Honorary Life Membership Award by the College of Pharmacy of Manitoba for meritorious service and professional contributions to Pharmacy. The Aubie Angel Young Investigator Award for Clinical Research Committee selected Dr. Chris Wiebe (Section of Nephrology) as the 2018 recipient of the Aubie Angel Young Investigator Award. The awards ceremony will take place Tuesday, June 12 at 10am in Theatre B in the Basic Medical Sciences Building. The 2018 Internal Medicine Residents’ Educator of the Year Award was presented to Dr. Aditya Sharma (Section of General Internal Medicine) in recognition of his dedication and teaching excellence. Congratulations are extended to Dr. Justin Cloutier who was selected by the 2018 Max Rady College of Medicine and Presidents Council Residents Appreciation Reception planning committee as this year’s recipient of the Resident of the Year Award. The Dale Iwanoczko Award was awarded to Dr. Jeffrey Wheeler in recognition of his outstanding contribution to the Core Internal Medicine Residency Program demonstrating commitment, compassion, caring and integrity. 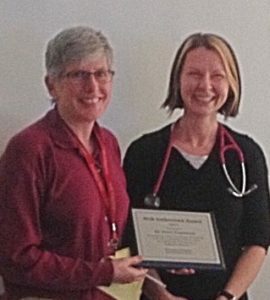 The Internal Medicine Subspecialty Resident Teaching Award, recognizing a subspecialty resident who exemplifies excellence in teaching and supervision, was awarded to Dr. Rachel Fainstein. Dr. Houston is a PGY5 resident, and is concurrently completing a PhD in the Department of Pharmacy. Her ultimate goal is to practice hematology and function as an independent clinician-scientist at the University of Manitoba where she hopes to be engaged in patient oriented, practice-changing research in the fields of hematology, transfusion medicine and blood conservation. With a generous gift from Dr. Hector T. G. Ma to the University of Manitoba in 2015 – an endowment fund to enhance resident research in Internal Medicine was established. Dr. Ma, a graduate of the University of Manitoba (M.D./59) is currently the Director and Senior Consultant Radiologist in the Scanning Department at St. Theresa’s Hospital in Hong Kong. In addition, the Department of Internal Medicine provides matching funds to the award. 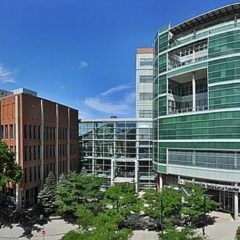 To be eligible, residents must be: enrolled full time in the Department of Internal Medicine and be in good standing, demonstrated outstanding interest and commitment to research and performing a supervised research project. Congratulations to Dr. B. Houston on being chosen the inaugural winner of the award. We are pleased to announce that the following Department of Internal Medicine Faculty members are recipients of the 2018 Doctors Manitoba Awards. Dr. Amarjit Arneja – Distinguished Service Award – in recognition of service provided to patients and the community which has enhanced the image of the physician through devotion to the highest ideals of the medical profession and in the promotion of the art and science of medicine through teaching, writing and administration. 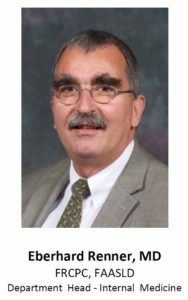 Dr. John Embil – Scholastic Award – for scholarly activity in the health professions. Dr. Arneja and Dr. Embil will be recognized at the Friday, May 4, 2018 Doctors Manitoba Awards and Presidential Installation Dinner at the Fort Garry Hotel, Winnipeg. Congratulations are extended to Dr. Amarjit Arneja and Dr. John Embil. Professionalism is an “in” word these days. It stands for more than political correctness. When googling it, one can find “professionalism is the skill, good judgment, and polite behavior that is expected from a person who is trained to do a job well”. Alistair Cooke (1908-2004), who was a well-known British-American journalist, television personality and broadcaster, is quoted as having said ”a professional is someone who can deliver his/her best work when he doesn’t feel like it”. The latter, of course, is hard, but, I guess it is what separates the wheat from the chaff. Creativity on the other hand can be defined as “the ability to transcend traditional ideas, rules, patterns, relationships, or the like, and to create meaningful new ideas, forms, methods, interpretations.” Creativity is the basis of every innovation and as such is indispensable for sustaining the success of any business in an ever changing environment. This holds particularly true for our Department’s situation in the middle of the ongoing health care reform in our Province. Creativity is easily mistaken to mean disorganized spontaneity with little or no accountability, and to be incompatible with professionalism which stands for predictability and trust. However, creativity and professionalism, as defined above, do not only go well hand in hand, but, are, in fact, mutually complementing each other. A creative professional finds new solutions to challenges, brings them respectfully forward and acts in a way that always has the greater good in mind. This does not mean having to enter a popularity contest or having to abandon (constructive) criticism, but to be mindful of one’s own (unconscious) biases and always respect a dissenting counterpart. The best solutions are not owned by a single individual/party, but created through respectful argumentation between engaged – albeit initially dissenting – professionals. Engagement is key here, our Department needs yours! 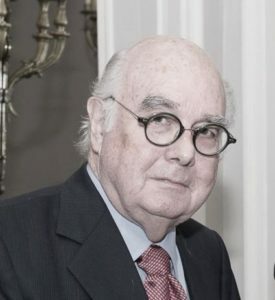 Dr. Richard Warrington was recently honoured for his long and continued service to the Royal College. Without volunteers like Richard Warrington – the Royal College could not fulfill their mandate. When asked about a time while volunteering for the Royal College when he felt that his contribution had made a tangible impact Dr Warrington recalled that “During an oral examination, a candidate became ill. There were apparently no regulations as to what to do, so we sent the candidate to Emergency to be assessed. When the candidate was considered recovered by the ER physician, with the candidate’s permission, we continued the examination successfully.” He stated that it is important to the College, to the medical profession, to the trainees and to the public to give back to the medical profession through work with the Royal College. Thank you Dr. Warrington for your over 30 years of dedication and service to the Royal College. Funding Source: Anesthesia Oversight Committee Operating Grant. Winnipeg Manitoba. Co-Principal Applicants: Neeloffer Mookherjee, Section of Proteomics and Systems Biology – University of Manitoba, and Chris Carlsten, University of British Columbia. Funds Awarded: $198,400 Duration: 2018 – 2020. I recently stumbled across the following sentence: “It is not the strongest of the species that survive, nor the most intelligent, but the one most responsive to change.” The line is attributed to Charles Darwin and struck me as pertaining to our current situation as busy providers in a health care system which seems to change at (too) many levels simultaneously and at a pace that makes one wonder whether there is still a system – if there ever was one in the first place. Working hard as a provider caring for patients in the middle of all these changes makes one feel powerless, generates anger and frustration which, in turn, carry the danger of leading to apathy and disengagement, potentially ending in burn-out. There are at least two other options: to leave or to speak up. While leaving for greener pastures, if there are any, may be a solution for an individual, it does not help those who cannot afford to quit for whatever reason and have to stay behind. The latter and the system as a whole need those who speak up; not for their own self-interests, but in order to improve the greater good and make our (health care) world a better place. This requires not only resilience and courage, but also the willingness to take on responsibility, and the ability to choose the right moment for the right message targeted at the right audience, i.e. patience paired with persistence; not an easy task. And then – and that’s where Darwin comes into play – we, as individuals, need to be willing to make an effort and adapt to an ever changing environment. Not just trying to find the hair in the soup, but tasting the flavor; not just getting stuck with pointing out the problems, but finding solutions; not always comparing with the past, but creating the future. This needs optimism, looking at the glass half full, always attempting to find ways to fill it up even higher. It also requires to listen and observe before judging, to swallow and reflect before talking, and to stay humble, always keeping the greater good in mind. If we accomplish this, we will not only make our health care world a better working place, but also survive into the future to provide the best possible care to our patients. Let’s do it, together we can!